Desdemona is a central female figure in Othello and makes a great research paper topic. Desdemona is a central female figure in Othello and makes a great research paper topic. Desdemona in Othello research papers is the focus and reason for Othello's grief, fury and murderous action, she is Iago's maligned tool, used to destroy Othello, and is the means by which Shakespeare unravels love and loyalty and turns it to betrayal and murder. Othello's obsession with Desdemona's fidelity drives the plot and provides the emotion in "Othello". Desdemona chooses her life with Othello, and participates much less in her own demise, protesting her innocence to Othello quite strongly in Act 4, to no avail. She is a victim who is overpowered, not by her own mind or an inclination toward death, as Ophelia is, but by subtle subterfuges far too complex for her to discern, by a society that dismisses, insults and devalues the words of women, and finally, by Othello's brute strength. The literal and symbolic death of Desdemona illustrates how an innocent woman can be harmed by society, the men she associates with, and by her own lack of worldliness. 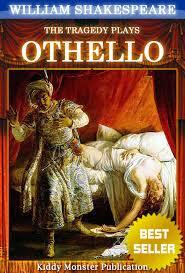 Because of this, it is the victim who creates internal tragedy and motivates the plot in “Othello”. The Theme of Othello research papers discuss Shakespeare's Literature. Shakespeare research papers custom written for college students. Othello, The Moor research papers discuss the origins of the character Othello. Order a research paper on Othello from Paper Masters. Romeo and Juliet and Othello research papers - In Romeo and Juliet we have a play that is probably to be dated at 1595 and which was the second of Shakespeare's tragedies, Titus Andronicus being the first. Shakespeare Plays - Tragedies, comedies and histories. Romeo and Juliet, Othello and King Lear are three more of the dozen tragedies that William Shakespeare wrote. A Complete List of Shakespearian Tragedies. How to Write a William Shakespeare Biography - Apply the discussion from part three to MacBeth, Romeo and Juliet and Othello, hitting specifically on the evils that lurk within both. Shakespeare's Plays - For instance, one can see Shakespeare's unequalled imagination working as he dreams up Othello's paranoia about his wife Desdemona. Love's Labour's Lost Research Papers on Shakespeare's Play. Romeo and Juliet and Othello research papers compare the similarities between the two classic tragedies. William Shakespeare research papers examine the life of Shakespeare and discuss his plays, sonnets, and poems. A Biography of William Shakespeare for an English Literature Research Paper includes original and new research on the Master of English literature. Macbeth research papers examine one of Shakespeare's most famous tragedies. Supernatural Elements of Hamlet Research Papers -Of course, there is no mistaking one supernatural element to the play, and that is the prominent role played by the ghost of Hamlet's father. Shakespeare's Histories - Order custom research papers on shakespearean histories for fresh, new research on Shakespeare's historical plays. Richard II is one of Shakespeare's tragedies and the wars that follow has a certain Greek quality of fatalism to it. Measure for Measure research papers examine one of Shakespeare's problem plays that entails both comedy and tragedy. Shakespeare Quotes research papers examine the many famous quotes from the writings of William Shakespeare. King Lear research papers delves into a play by William Shakespeare based on King Lear and how is character is the center of the plays purpose. Paper Masters writes custom research papers on Desdemona in Othello and discuss the central female figure in Othello.